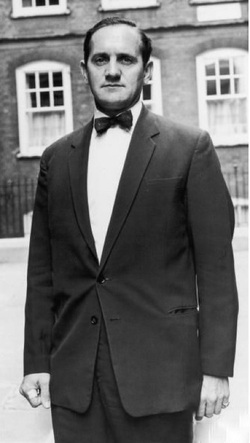 When Inspector Leonard "Nipper" Read of Scotland Yard was promoted to the Murder Squad, his first assignment was to bring down the Kray twins. It was not his first involvement with Reg and Ron; during the first half of 1964 Read had been investigating their activities, but publicity and official denials surrounding allegations of Ron's relationship with Boothby had made the evidence he collected useless. Read tackled the problem of convicting the twins with renewed activity in 1967, but frequently came up against the East End "wall of silence", which discouraged anyone from providing information to the police. Nevertheless, by the end of 1967 Read had built up evidence against the Krays. Witness statements incriminated them, as well as other evidence, but none added up to a convincing case on any one charge. Early in 1968 the twins used a man named Alan Bruce Cooper who hired and sent Paul Elvey to Glasgow to buy explosives for rigging a car bomb. Elvey was the radio engineer who put Radio Sutch, later renamed Radio City on the air in 1964. Police detained him in Scotland and he confessed he had been involved in three botched murder attempts. However, this evidence was weakened by Cooper, who claimed to be an agent for the United States Treasury Department investigating links between the American Mafia and the Kray gang. The botched murders were his work, in an attempt to pin something on the Krays. Read tried using Cooper, who was also being employed as a source by one of Read's superior officers, as a trap for Ron and Reg, but they stayed away from him. Eventually, a Scotland Yard conference decided to arrest the Krays on the evidence already collected, in the hope that other witnesses would be forthcoming once the Krays were in custody. 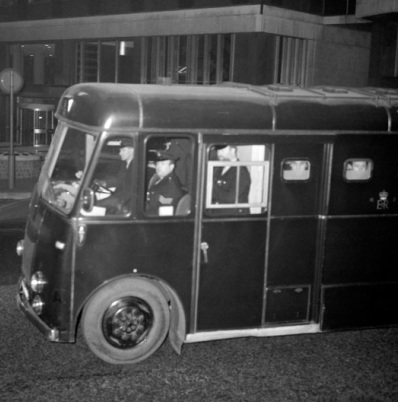 On 8 May 1968, the Krays and 15 other members of their "firm" were arrested. Many witnesses came forward now that the Krays' reign of intimidation was over, and it was relatively easy to gain a conviction. The Krays and 14 others were convicted, with one member of the firm being acquitted. One of the firm members that provided a lot of the information to the police was arrested yet only for a short period. Out of the 17 official firm members, 16 were arrested and convicted. The twins' defence, under their counsel John Platts-Mills, QC, consisted of flat denials of all charges and the discrediting of witnesses by pointing out their criminal past. The judge, Mr Justice Melford Stevenson said: "In my view, society has earned a rest from your activities." Both were sentenced to life imprisonment, with a non-parole period of 30 years for the murders of Cornell and McVitie, the longest sentences ever passed at the Old Bailey (Central Criminal Court, London) for murder. Their brother Charlie was jailed for 10 years for his part in the murders. On 11 August 1982, under tight security, Ronnie and Reggie Kray were allowed to attend the funeral of their mother Violet, who had died of cancer the week before, but they were not allowed to attend the graveside service at Chingford Mount Cemetery in East London where their mother was interred in the Kray family plot. The service was attended by celebrities including Diana Dors and underworld figures known to the Krays. The twins did not ask to attend their father's funeral when he died seven months later in March 1983, to avoid the publicity that had surrounded their mother's funeral.